Vice President Henry Van Thio underscored the need for Myanmar farmers to improve the quality and price of rice to make it more globally competitive. A French tourist has been arrested for flying a drone near Myanmar’s parliament in the capital Naypyidaw, the French embassy confirmed Monday (Feb 11). Companies in Myanmar are now required to establish mechanisms for employees to report suspected corrupt practices, according to the latest government announcement. The Central Bank of Myanmar (CBM) has said it will allow traders to make payments through banks for conducting trading activities with China. Public interest in local Myanmar movies is on the rise and movie show times had to be extended as cinemas are crowded. Despite the benefits of gradually reducing Myanmar’s US dollar dependency in trade, experts and traders foresee a slew of shortcomings and challenges in permitting the use of the Japanese yen and Chinese yuan in international settlements. On 20th April, 2018, the Myanmar Investment Commission (MIC) issued Notification 7/2018 (the ‘Notification’) to broaden the scope of investment activities permitted in education services. The value of bilateral trade between Myanmar and Germany in the first quarter (Oct-Dec) of the 2018-2019 fiscal year reached a peak of US$172.87 million, with exports worth $130.8 million and imports valued at $42 million, according to statistics released by the Ministry of Commerce. Myanmar authorities have seized six tons of illegally harvested teak timbers in Taikkyi, Yangon region, the official Global New Light of Myanmar reported Monday. MAINBOARD-LISTED company Yoma Strategic Holdings will be acquiring a 65 per cent stake in one of Myanmar’s largest restaurant chains, Yankin Kyay Oh Group of Companies Limited (YKKO), for around 19.4 billion kyat (S$17.1 million), the company said in a media statement. Search and rescue works have been underway for the missing in a vessel capsizal near a lighthouse in Manaung, Myanmar’s Rakhine state, Rakhine State Fire Department said on Monday. Rice traders from Mandalay should not solely depend on China and to find new markets in Yangon, said Mandalay Region Chief Minister Dr Zaw Myint Maung in a meeting of Myanmar Rice Federation held at Mandalay on February 9. GALWAY CITY COUNCIL has voted to revoke the freedom of Galway from Myanmar leader Aung San Suu Kyi. Whether your preference is to call it Burma or Myanmar, the fact is that today’s Myanmar is an infinitely preferable place to the Burma depicted by George Orwell in “Burmese Days” and others who have written about the country. A Geneva-based company has made a US$2 million investment for a major microfinance fund in Myanmar. AsiaBaseMetals Inc. (the “Company”) (TSX-V: “ABZ”) is pleased to announce that is pursuing mining opportunities in Myanmar, a country with exceptional geological merit and a country now moving onto the world stage, especially in the mining sector. Buddhist refugees recently displaced by fighting between Myanmar’s military and insurgents face hard times in a remote Bangladeshi village and at the border between the countries. No decision was reached at a meeting on Friday on the number of MPs from each political party that will form the Constitutional Amendment Joint Committee that has been approved by the Pyidaungsu Hluttaw (bicameral legislature). The U.N. refugee agency says it is worried by reports of people fleeing escalating violence in Myanmar’s southern Chin State and Rakhine State, adding to growing instability in these regions, VOA reported. A woman in Singapore who abused her Myanmar domestic helper by forcing her to pour hot water on herself, pulling her hair out and hitting her was jailed for three years on Monday. The government is opening elephant protection camps to increase the earnings of the State through green business or sustainable business that is not harmful to the natural environment, state media reported quoting Union Minister for Natural Resources and Environmental Conservation U Ohn Win yesterday at the opening of the country’s 19th elephant protection camp, the Shwesettaw Mann Chaung Elephant Protection Camp, Minbu Township, Magway Division. Just around the corner is the auspicious Union Day to be celebrated across the country, and that Nay Pyi Taw weather is cool and serene pleasant as befits the cold season. South Korea’s largest automaker Hyundai Motor Co. that has been putting out efforts to expand its presence in Southeast Asia opened its first knockdown plant in Myanmar where its all-new Accent will be assembled. Vice President U Henry Van Thio, the head of the Leading Committee for the Protection of Farmers Rights and Promotion of Interest, has called upon rice traders and farmers to control the quality and food safety standards for rice to ensure the ability for farmers to compete in markets, pledging that the Union Government would work to increase international rice quotas through government-to-government negotiations. The crack at a dam in Myanmar’s Bago region poses no risk to public safety following several earthquakes that jolted Paukkaung, Bago region last year, Xinhua reported quoting an initial assessment of the Myanmar Dams National Committee. 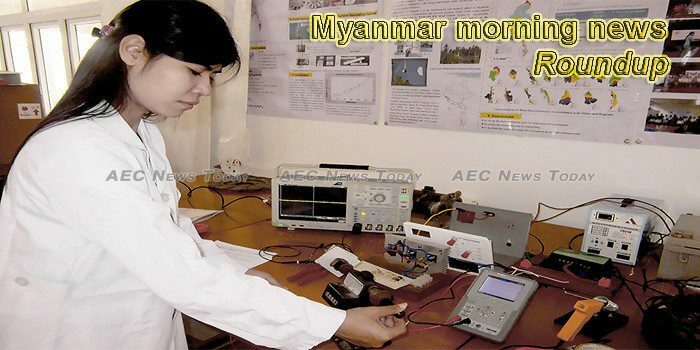 An opening ceremony of a new precise measurement science (Myanmar) building was held in the compound of Department of Research and Innovation at No. 6 Kaba Aye Pagoda Road, Yankin Township, Yangon yesterday morning. Nay Pyi Taw Council Chairman Dr. Myo Aung met with Hluttaw representatives, departmental officials, ward/village administrators, local elders of Ottarathiri Township at the township general administrative department meeting hall yesterday morning to learn about the regional development works in the township and the requirement of the people. This week’s morning news photo features International Day of Women and Girls in Science, February 11. One Response to "Myanmar morning news for February 12"